I’ve previously written  on The Strategist that it’s time for Australian policymakers and academics to see the South Pacific as an ‘arc of opportunity’, rather than an ‘arc of instability’  (PDF). That proposal was tested at an 8 February workshop  at the Australian National University (ANU), which brought together two often separate communities: security and strategic thinkers on the one hand; development and governance thinkers on the other. The overwhelming consensus was that it’s time to reframe Australian perceptions of the South Pacific to focus not only on the region’s challenges but also its potential. Professor Peter Leahy, Director of the National Security Institute at the University of Canberra, emphasised that the region sits across the ‘shoulders and flanks of approaches to Australia’, and therefore that securing it through supporting development offers an opportunity to make Australia more secure. Emeritus Professor Paul Dibb from the Strategic and Defence Studies at the ANU stressed that these efforts should focus on strengthening South Pacific states  (PDF), reflecting the approach of the recent National Security Strategy . His Excellency Charles Lepani, Papua New Guinea High Commissioner to Australia, argued that the relationship between Australia and Papua New Guinea should shift from one of ‘perceived dependence’ to one of ‘mutual respect’, in which Australia recognises Papua New Guinea’s trade, investment and other economic opportunities. James Batley, Deputy Director General of the Asia, Pacific and Program Enabling Group at AusAID, expressed confidence that the relationship between Australia and South Pacific states is improving and highlighted an emerging sense that Australia is working with the region as ‘partners’. Batley also argued that strengthening South Pacific states will involve new approaches to development at sub-national levels, including by working with communities and NGOs. ASPI’s Graeme Dobell agreed that the relationship between Australia and the South Pacific is improving and proposed enhanced economic integration, perhaps modelled on Australia’s Closer Economic Relations agreement with New Zealand, as another opportunity for Australia to build partnerships with the region  (PDF). A further way to build partnerships was proposed by Dr Quentin Hanich from the Australian National Centre for Ocean Resources and Security, who identified the potential for Australia to assist South Pacific states to more effectively harness the fisheries and other resources opportunities offered by their massive exclusive economic zones. Australian scholars who provided updates on five key South Pacific states: Papua New Guinea  (PDF), Solomon Islands  (PDF), Timor-Leste  (PDF), Vanuatu and Fiji  (PDF), agreed with the need to shift Australia’s perceptions of the region. Dr Sinclair Dinnen from the State, Society and Governance in Melanesia program at the ANU argued that the tendency towards viewing the South Pacific through a security lens highlighted the challenges facing the region, but obscured its potential and opportunities. Constructive proposals for how Australia and South Pacific states could engage with each other to develop this potential were provided by seven emerging Pacific scholars. Dr Jack Maebuta from the University of the South Pacific stressed that efforts to stabilise and develop the region must address the underlying causes of instability and underdevelopment via ‘culturally-appropriate deep interventions’  (PDF). Reflecting this call to address development and security at the community-level, Serena Sasingian, Executive Director of The Voice Inc. , called for a paradigm shift to make Pacific islanders agents in their own development, rather than passive aid recipients. In Papua New Guinea, both Sasingian and Vergil Narokobi from Victoria University, Wellington were optimistic that, if properly utilised, the constitutional National Goals and Directive Principles could provide guidance for human development in the future. The importance of local agency was also emphasised by Dr Patrick Vakaoti from the Department of Sociology, Gender and Social Work at the University of Otago. Echoing Batley’s proposal for sub-national engagement, Vakaoti outlined a series of proposals for how Australia could enhance its engagement with Fiji’s young, future leaders. 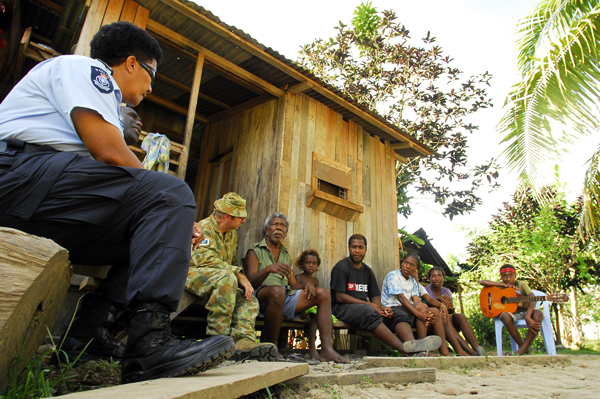 The importance of engaging at the community-level in Fiji  (PDF) was also highlighted by Jone Baledrokadroka from the State, Society and Governance in Melanesia program at the ANU in the context of Fiji’s ongoing return to democracy. The need for Australia to utilise new approaches to development at sub-national levels was also supported by Tony Hiriasia from the University of the South Pacific, and Greg Nimbtik from RMIT University. They provided fascinating accounts of the opportunities for local customary practices to develop and secure Solomon Islands and Vanuatu by increasing the legitimacy and effectiveness of governance practices and institutions. The overall message of the workshop was that security and development in the South Pacific are linked, and that Australia’s approach to the region should integrate the two. While participants acknowledged the challenges facing the region, they also identified myriad opportunities for security and development to be achieved, which suggests that it is time to shift Australian perceptions of the region from that of an ‘arc of instability’ to an ‘arc of opportunity’. Joanne Wallis is a lecturer in the Strategic and Defence Studies Centre at the Australian National University, where she also convenes the Asia-Pacific Security program. Image courtesy of Department of Defence . A video discussion of the workshop theme is available at the ANU’s YouTube channel . Videos of the presentations made at the workshop will be available soon.